We recently added a new artist to our Nest, the very talented Rebecca Noel. Rebecca is from Ohio, USA and she makes the most interesting and unique leather cuffs and also some fantastic jewellery which we will be uploading to Rebecca's artist page soon. 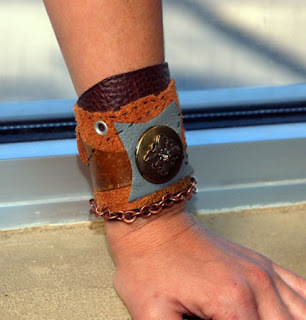 You can check out the range of leather cuffs at this link. Once you click on one of Rebecca's products, you can also find out a bit more about Rebecca at the artist story section - Rebecca's favourite recipe is Southwest King Ranch Casserole, which sounds absolutely delicious to us, YUM!